Looking back through my brewing logs, I’ve never brewed two batches as close together as I did these past two. I’m of the school of thought that the best way to get good at something is to do it often. It was nice to have my brewing process fresh in my mind when approaching this brew night. The last batch a hoppy pale ale is just off dry hops as I write this brew day up. This batch is a rebrew of the english mild I brewed last summer. The first time I brewed this, I made a biab beer. Taking a very simple approach and not worrying about it. 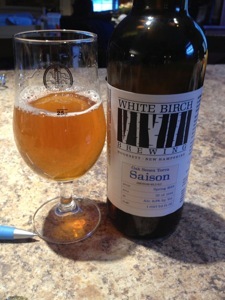 This might have been one of the better batches I brewed last year. This time I have a slightly different target. I’ve been asked a few times if it is possible to make an NA beer, so I’m trying to brew a very low abv beer, and make it as close as I can to Non Alcoholic Beer(NA). I figured it makes the most sense to start with a flavorful low abv beer. Research (googling) and turned up anecdotal stories, but no well documented first hand experiences with abv testing. I found two approaches to making NA beer, heating the beer to evaporate the alcohol, or freezing the beer to concentrate the alcohol and sugars leaving behind low alcohol beer ice. There are issues with either approach. Heat and Oxygen are known to damage beer. However I can’t think of a way to achieve the goal of low abv beer w/out exposing the beer to these factors. If someone has done this and has found a reliable way to do it with good results please let me know. With that said, I wanted to start with a known recipe for a low abv beer so I chose the mild. With the goal in mind, and my new analytical approach I made a few changes. Since a portion of this beer will be reheated, potentially evaporating off aroma, and flavor, I wanted to push the hopping out until later in the boil. 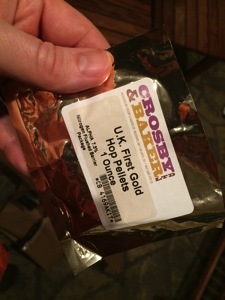 Since I was pushing the hopping to late, I increased the hopping rate from a 1/2 oz of 4.5%AA goldings at 60, to a full oz of uk first gold 7%AA at 15 minutes. The other change was brewing method, first time I brewed this as a BIAB batch, this time I’d be using my small mash tun 3 gallon setup and following the brew process that worked for my last brew night. As part of hardening my brewing process, I planned the night out in detail, and I’m working on a template to be generated by my brewing software for each batch. I’m still sorting out all the details to include. One item on the check list is to adjust mash ph. I took the known recipe and used brewers friend’s water chemistry tool to determine mash additions of acid malt. I’m not sure BeerSmith can do this type of estimation, it would sure simplify my process if it could. In a prior batch I measured, but forgotten to mill and include a pound of mixed grains, so I included it in this beer. The grains are a subset of the existing malts so it shouldn’t skew the flavor. I know, not the best analytical / reproducible approach. The yeast ( wyeast 1968 London ESB) was freshly harvested from my prior batch, so I did not need to make a starter. In advance I filtered my water, brought up my brewing gear, and milled my grains. I even managed to fill the sample jar of water for my Ward Labs test and sent it off. Things were in order for a smooth brewing night. I got under way at 9pm, I used the chef alarm to warn me when approaching strike temp. I mashed in at 157, a degree lower than target, but still plenty high. Once again I took mash ph late, but it still fell within spec (4.6-5.0 +.3). This time I lined my mash tun with a biab bag to prevent the stuck sparge issues and it worked, so I had no issues collecting either batch sparge. I know how much sparge water I’m adding, but my brewing kettle isn’t marked so I don’t know exactly how much I’m collecting. The pre boil gravity was on target so I was not concerned for this batch. I would like to know my volume, so I now when I should stop collecting, and get a better understanding of my effiency. The boil was uneventful despite the off and on rain. Since this is not a hoppy beer, I could skip whirlpool hopping and I chilled directly from boil. 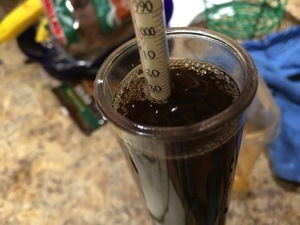 Once cooled, I collected a sample and compared hydrometer and refractometer. I was happy to hit my expected og of 1.037. I filled a 3g carboy of very wort from the kettle. I was sure to not over fill this batch. I ran off the rest of the wort with some break and trube into a separate 1g fermenter. I oxygenated the 3g carboy with o2 for a 10 count, pitched 1/2 a pint of washed 1968. In the 1g of other wort I directly sprinkled 1/2 a package of us05. Once the 3g carboy was in the water bath I then setup the beer bug. I was more cautious about how full the carboy was and set the blowoff tube right away. 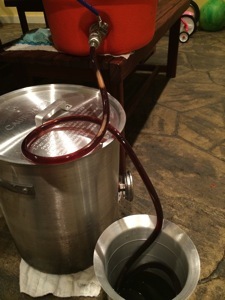 I had a heck of a time getting the bug to level using a glass carboy and a universal stopper. The factors at play are the low hole in the stopper, the neck design of the beer bug and the leverage exerted by the blowoff tube. Getting it to sit just right so the forces on each were balanced was a real pain. Ultimately I was able to get it level, tared, and logging my fermentation. Once again I finished after 2am. Adding biab bag to brew kettle. Do not lift the bag next time. Milling. 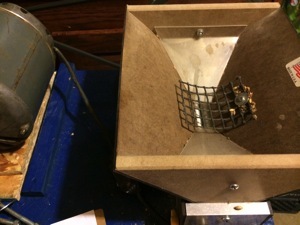 Finally didn’t have a snafu with the milling table. Using the chef alarm to warn when reaching strike temp. Planning the brew day has been really beneficial. Identify water additions to make hop flavor pop. Make first draft of brew template. Drill a hole into the mash tun for temperature monitoring during mash. Determine appropriate amout of o2 for beer. Buy a thermowell for my fermenter. Learn about water adjustments in BeerSmith. Mild brew night with friends Brewing Daisy Cutter pale ale Clone Pumpkin (winter squash) ESB, a seasonal beer brewed with the season Take two on brewing a partigyle imperial stout Brewing Log: Rye Saison with wild dregs.